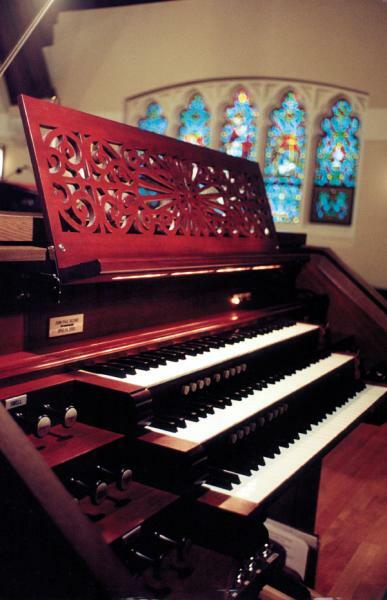 The new organ at North Shore United Methodist Church, Glencoe, Illinois, is our 24th instrument. It is distinctive in that it utilizes balanced mechanical (tracker) key actions for the manuals and pedals, incorporating devices which automatically regulate the action at times of barometric change. The console is detached from the case and reversed, so that the organist can see the entire church and choir director. A decoratively pierced music rack assists the organist in seeing past the console top, adding delicacy and bit of playfulness to the design. 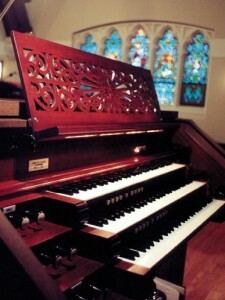 The organ has 14 independent stops and 17 ranks of pipes, across two manual divisions and the pedal. There are three keyboards however, the bottom manual being a permanently coupled Great and Swell, so that one can play both the manual divisions together without having to engage and disengage a coupling mechanism. This additional keyboard provides much more flexibility, and allows the organist the ability to move from each division to both coupled instantly. The stop actions are all electric, and a solid-state combination action has been provided, for registrational flexibility. The organ case and console are made of dark stained solid white oak, with Honduras mahogany accents. The façade Principal pipes are made of polished 75% English Tin, taken from the Great 8′ Open Diapason and the Pedal 8′ Principal. These pipes were designed to cherish the stained glass window behind, which was raised 3 feet in the wall to accommodate the new organ’s design. The lowest eight pipes of the 16′ Bourdon are made of Honduras mahogany, and are displayed in the two pedal towers on either end of the case. The quatrefoil rails in front of both the pedal towers’ pipes and the quatrefoil rail in front of the polished tin facade pipes relate to similar shapes found elsewhere in the room. A blue background seen through the quatrefoil cut-outs brings the colors of the window into the organ, and a tasteful amount of gold-leaf striping accents the shapes. The entire case exhibits a confident blend of the Tudor Gothic period as seen through the eyes of the Victorian era, in keeping with the architecture of the Church.